Bill Savidan flags down the impressive Benimar Perseo 591 and finds some stylish secrets cleverly stowed within the smooth exterior. Benimar has been making motorhomes for 26 years. 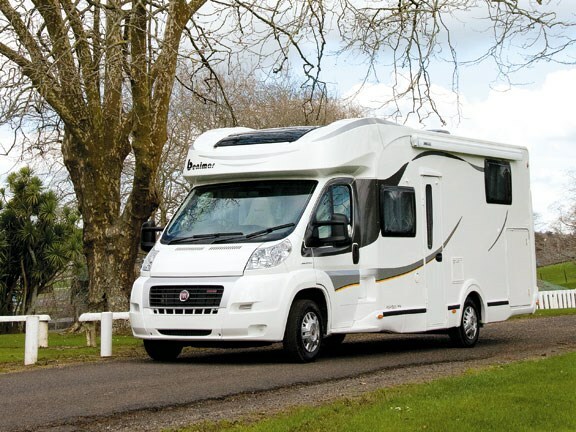 In 2002, the company joined the Trigano Group alongside other well-known motorhome brands, such as Auto Trail, Tribute, Roller Team and Caravans International (CI). Increased investment in design and manufacturing processes is reflected in the improved style and quality of the current models. Benimar motorhomes have been imported into New Zealand by Auckland Motorhomes Ltd for a number of years now. 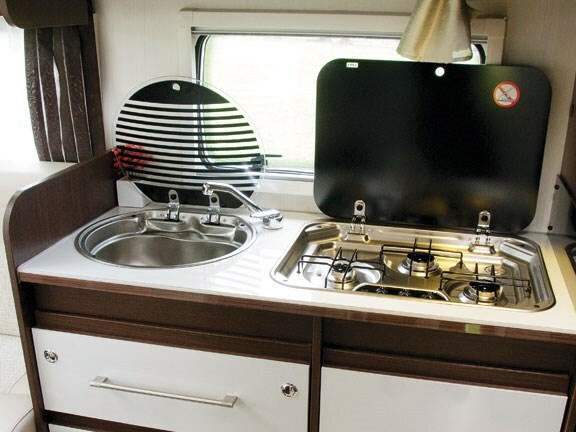 One reason for their popularity in this country is that they have the door 'kiwi kerbside' – one of the few European-built motorhomes with this feature. My first impression of the Perseo 591 was of a typical modern European motorhome. 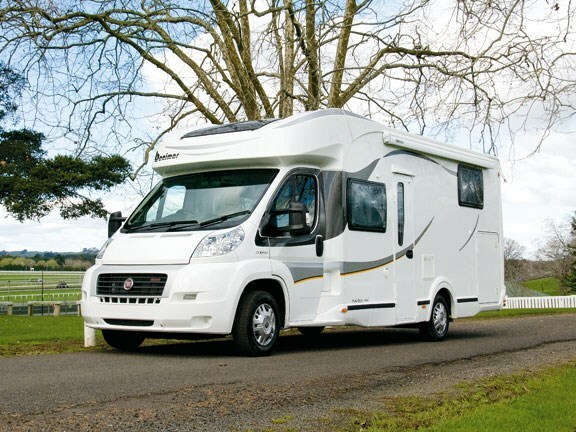 Built on the Fiat Ducato cab/chassis, this one is powered by the 180 Multijet three-litre turbo-diesel motor, matched with the six-speed Automated Manual Transmission (AMT) gearbox driving the front wheels. It has single rear wheels. The low-profile motorhome body is skilfully blended into the cab, with neatly faired mouldings and stylish body graphics. There is a slim-moulded running board to assist when entering and leaving the cab. At the rear, the simple mouldings that house the turn, park and stop lights are attractive to look at and easy to replace should they get damaged. There is just the one huge storage 'garage' that stretches across the rear of the motorhome, with a large external door each side. There is no rear window leaving plenty of room for a bike rack should you decide not to carry bikes in the 'garage'. If you are seeking a motorhome with a private bedroom that can be closed off from the rest of the motorhome, the Perseo 591 could be your vehicle. A solid door closes off the rear bedroom from the kitchen/dining/lounge area at the front. The 'north/south' double bed has access from both sides. A nice touch is the large hanging wardrobe at the foot of the bed. It has a forward-facing pair of doors, but it is easier to access if you raise the foot of the bed base, allowing access from the top as well as the front. However, the most unusual feature in the bedroom is the en-suite arrangement. At first glance, these facilities seem a bit intrusive: the separate shower in one corner and the toilet/vanity in the opposite corner. Both have their own ceiling hatch for ventilation. But after hopping into the shower space and closing the screen then closing off the toilet vanity area with its privacy screen, I came to the conclusion it was a clever way of creating a feeling of spaciousness in what otherwise could have become a claustrophobically tiny bedroom had each separate area been 'walled-off'. I must confess to preferring 'light and airy' as the basis for RV interiors. Dark chocolate-coloured panels have not appealed at all – until I saw them in the Perseo 591. Used sparingly in conjunction with off-white doors, bench tops, table and upholstery, the dark panels looked contemporary and chic, while retaining a feeling of warmth and comfort. I liked it. The tabletop, bench tops and door fronts have an unusual glass-like appearance, created with the clever use of resins. This vehicle was upholstered using the Palma colour scheme. There are four other fabric colours and one leather option. Kiwi RVs traditionally have lounge seats to lie about on and long kitchen benches for meal preparation and serving. European RV lounges are more often social conversation snugs, with cab seats for lounging in and compact kitchens that require more discipline and organisation at mealtimes. So it is with the Perseo. The lounge/dining area is located at the front so the cab seats, when rotated, provide comfortable lounge seating. The L-shaped dinette faces the cab. Although the dinette seats are upright, they have deep cushions and offer support in all the right places. A lot of thought has gone into the design of the dining table. The substantial table pedestal is telescopic. At the turn of a key, an electric motor lowers the tabletop to form a bed base so the dinette can be converted into a bed. On top of this pedestal is a solid frame for the tabletop. This frame can be moved forwards and sideways into a variety of positions and then locked into place to suit the number of diners – one to five. 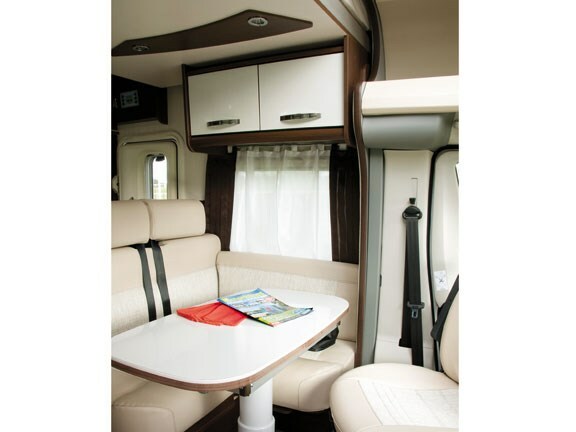 Even when laden with food, plates and glasses of wine, it is safe to slide the table aside to allow those seated in the cab seats access to the body of the motorhome should the need arise. It is a very practical table for dining and entertaining, rather than being the obstacle some tables turn out to be when put to use. On the right side of the kitchen bench is a three-burner Smev gas hob; on the left side, a circular sink with a bench-mounted folding faucet. Both have fold-down glass tops that create most of the bench space. It is not a lot of room but sufficient if the tabletop is used as a second bench. There are four drawers below the bench – the top one has a cutlery tray and the bottom one is large enough for pots and pans. The cupboard under the bench is quite shallow and best suited for washing up and cleaning gear. There is a also floor to ceiling slide-out pantry opposite the 160-litre Dometic model RMDT8505 three-way auto-select fridge/freezer and, together, they should swallow most of the supermarket shopping, with room to spare. A small Dometic grill/oven matches the appearance of the fridge/freezer and sits just above it. I'd read the Perseo slept five but when first I went aboard, I could not work out where they all slept. This is the Perseo's secret. My grandkids would love it. In our motorhome, their sleeping place of choice is up the ladder to the bed over the cab. The Perseo doesn't have space over the cab for a bed. Instead, the ceiling panel over the dinette lowers down, bringing with it a double bed that can be made up in advance so it always ready for use. A ladder is provided for access or, if you are really agile, you can reach the bed by stepping off the cab seats. While you can access the cab from the motorhome with the bed lowered, there is insufficient headroom to sit in the dinette seats. However, should the dinette be converted into a bed there is plenty of room for the occupant. It is a very novel way of providing an additional double bed for occasional overnight guests. 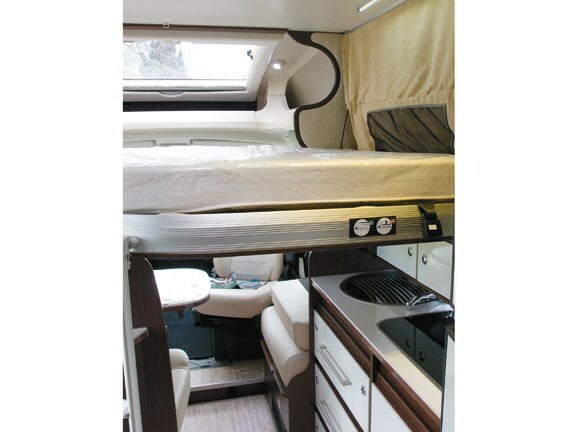 The Perseo 591 incorporates some of the newest ideas in motorhome interior layouts and features some of the latest thinking in decor and finishes. It is sure to arouse a lot of interest in the marketplace. Other items that come as standard: a Truma combination water/central heater; an LCD TV with Apollo auto-tune satellite TV aerial, LED lights throughout, two 12-volt house batteries, reversing camera and screen and Para Press double-skinned acrylic windows. For more information, ph 09 294 6500 or visit aucklandmotorhomes.co.nz.